Those of us who feed our dogs a raw diet that includes bones believe that this is the healthiest, most natural diet they can eat. But not everyone is comfortable feeding such a diet to their dogs. You may worry about bacteria or parasites in raw meat, or about feeding bones, or you may have a dog who doesn’t enjoy or do well on a raw diet. If you prefer to feed your dog a cooked diet, or a diet that includes raw meat but no bones, that’s fine; everyone needs to do what feels right to them. Your dog will still benefit from a variety of fresh foods in proper proportions, regardless of how they’re prepared. For simplicity’s sake, these diets are often referred to as cooked diets, but the meat portion may be fed raw if you choose. Cooked diets that do not include bone are a little more difficult in terms of making sure that all of your dog’s nutritional needs are met. We can supply the calcium that bones provide from other sources, but it is hard to know exactly which other nutrients present in fresh bone might be missing in a bone-free homemade diet. In addition, cooking destroys or reduces certain nutrients, such as vitamins C and E, and taurine. Cooking in water also leaches out minerals, though this can be resolved by feeding the water the food was cooked in. Light cooking at lower temperatures has less effect on nutrient value than cooking foods until they are well done. While dogs (particularly adult dogs) can survive on a wide variety of diets, this article will give you guidelines for optimal nutrition, to help your dogs live the longest, healthiest lives possible. 1. Variety: A homemade diet must include a variety of different foods, not just meat and grains. It’s best to feed many different types of meat (beef, lamb, pork, chicken, turkey, fish, etc. ), as well as other foods, such as organs, eggs, yogurt, and healthy leftovers. Most people who feed cooked diets also feed grains or starchy veggies. If you do, make sure that meat and other animal products make up at least half the diet, and preferably more. Remember that dogs do not require carbohydrates, and they do not supply as much nutrition to dogs as animal products do. 2. Balance over time: When you feed a wide variety of different foods, there is no need to make each meal “complete and balanced.” Think of how you eat yourself, and how you feed your children, providing different foods at different meals and on different days. Make sure your dog gets everything he needs over a week or two, not at every meal. 3. Calcium: One of the most common mistakes that people make when feeding a home cooked diet is the failure to add calcium. You must add calcium when you feed a diet that does not include bones. Adult dogs need around 800 to 1,000 mg of calcium per pound of food fed. They also require the calcium to be supplied in a proper proportion to phosphorus. The ideal calcium:phosphorus ratio in the canine diet is between 1:1 and 2:1. Meat contains a lot of phosphorus, so the more meat a diet contains, the more calcium will be required to reach the correct calcium:phosphorus ratio. Adding 800 to 1,000 mg of calcium will provide the correct calcium:phosphorus ratio even for a high-meat diet, unless you use a calcium supplement that also contains phosphorus. In that case, moderately higher amounts of calcium may be needed to balance out the additional phosphorus contained in the supplement. Ground eggshell can be used as a calcium supplement. Rinse eggshells and dry them on a counter overnight, or in the oven, then grind them in a clean coffee grinder. One large eggshell provides one teaspoon of ground eggshell, which contains 2,000 mg of calcium, so add ½ teaspoon ground eggshell per pound of food fed. Don’t use eggshells that haven’t been ground to powder, as they may not be absorbed as well. You can use other types of calcium supplements (any form of calcium is fine). Calcium from seaweed, such as Animal Essentials’ Natural Calcium, also supplies other minerals (including magnesium, iodine, and selenium) that are beneficial. Bone meal is frequently used as a source of calcium in diets that don't include raw bone. However, bone meal contains calcium and phosphorus. Different brands of bone meal supplements contain different amounts of calcium and phosphorus, but the calcium:phosphorus ratio is always the same: 2:1. To balance a diet that contains lots of phosphorus, then, you will need to give an amount of bone meal that will provide 1,000 to 1,200 mg calcium per pound of food to keep the ideal calcium: phosphorus ratio in the diet correct. Look for bone meal supplements that are guaranteed to be free of lead and other contaminants. You can also use a purified bone extract called Microcrystalline Hydroxyapatite (MCHA), but most of these supplements also contain vitamin D in high amounts, which would not be appropriate to use (see Supplements section further on in the text). Another option is to use a supplement designed specifically to balance a limited diet, including supplying the proper amount of calcium. There are two products designed to balance diets that are high in meat: See Spot Live Longer™ Homemade Dinner Mixes and Wysong’s Call of the Wild. Two additional products are designed to balance diets that are high in carbohydrates: Vitamins & Minerals for Home-Cooked Dog Food made by Furoshnikov's Formulas, and Balance IT. Update: Balance IT now offers a Carnivore Blend for high-meat, no-carb diets as well. See Dog Food Mixes for up-to-date information on these and other supplements designed to balance homemade diets. When you use supplements or pre-mixes designed to balance a limited diet, you should restrict the amount of liver you feed to no more than half the amount recommended below, due to high levels of vitamin A. Also, do not add kelp (due to the risk of excess iodine, which can interfere with thyroid function), unless the pre-mix instructs you to do so. You can cook meat-based foods that contain ground bone, but this is not ideal. Cooking food that contains a large amount of ground bone can lead to constipation or even impaction. That’s why cooking ground-up necks, backs, wings, etc. -- or commercial blends that contain ground bone -- is inadvisable. Either feed this ground food raw, or add in an equal amount of meat (without bone) to lower the percentage of bone in the mix. Again, when bones are fed, you do not need to add calcium to the diet. When feeding a homemade diet, it is essential that different types of foods be fed in appropriate proportions. Meat, eggs, dairy and other animal products should make up at least half of the diet, and preferably more. The diet needs to include organ meats as well as muscle meat. Liver and kidney should make up around 5 percent of the total diet (I used to advise as much as 10 percent, but I think 5 percent is better). It’s best to feed small amounts daily or every other day, rather than large amounts at one time. Because these organs are so nutrient-dense, use the raw weight to determine the amount to feed. For example, if you feed a total of 20 ounces of food daily, use 1 ounce of raw liver/kidney, even though the cooked weight will be less. If possible, make heart (nutritionally, more of a muscle meat) another 5 to 10 percent of the diet, or even more, though too much may lead to loose stools in some dogs. Eggs are an excellent source of nutrition. They can be soft-boiled, hard-boiled, gently scrambled, etc., or fed raw, if your dog likes them that way. You can feed as many eggs as you want, as long as you still feed lots of variety. Dairy products, such as yogurt, kefir and cottage cheese, are well tolerated by most dogs and offer good nutritional value. Yogurt with added probiotics and kefir (another cultured milk product) have the added advantage of providing beneficial bacteria (probiotics). These products should be added after the food is cooked. Goat’s milk may be tolerated by dogs who have problems with cow’s milk. Vegetables are optional, but provide many benefits. Leafy greens are among the healthiest veggies to feed; other good veggies include broccoli, cauliflower, brussels sprouts, bok choy, cabbage, turnips, rutabaga, celery, cucumber, bell peppers, zucchini and other summer squashes, carrots, and more. Spinach and swiss chard can be fed in limited amounts. These veggies provide few calories, so I usually advise adding them on top of the amount of food you feed, rather than calculating them as a percentage of the diet. Steaming is the best way to cook vegetables, as it removes fewer nutrients than boiling. You can add the water used to steam or boil veggies to the meal, as it will contain the minerals that were leached out during cooking (add leftover meat drippings, gravy, soups, sauces, etc., to make a savory broth). Some vegetables may cause gas if fed in large portions. Grains, legumes (beans) and starchy vegetables (such as potatoes, sweet potatoes and winter squashes) are usually included in cooked diets, but remember that dogs do not require carbohydrates in their diet, and plants supply incomplete proteins for dogs. If you do feed them, it’s best if they’re a small percentage of the diet, around one quarter or less. At a maximum, carbohydrates should never make up more than half the diet, with the other half coming from animal sources. Grains that can be fed to dogs include white rice, brown rice, oatmeal, barley, amaranth, quinoa, bulgur and more. Just as with other foods, feeding a variety of different grains and carbs is better than always feeding the same kind. Remember that grains contribute to weight gain and sometimes other health problems. If your dog is overweight or suffers from allergies, arthritis, seizures, urinary incontinence, chronic ear infections, IBD, or other digestive disorders, you may want to try feeding a diet without grains or starchy carbs to see if your dog improves. Fruits can be added to the diet in small amounts. Overripe fruits are easier to digest. Don’t feed grapes or raisins, which cause kidney damage to some dogs if too many are eaten. Good fruits to feed include apples, bananas, papayas, mangoes, berries and melon. Remember that you can also include healthy leftovers (foods you would eat yourself) from your own meals in the diet you feed your dog. While meals can be prepared individually, you may find it easier to cook up large batches at one time, and then divide the food into meal-sized portions and freeze. Because variety is important over time and not necessarily at every meal, you can feed the same foods for a week or two, and then switch to something else when you make the next batch. It’s best to add most supplements at the time of feeding, rather than mixing them in ahead of time, as many vitamins and other nutrients are affected by freezing, or by exposure to light or air. The probiotics found in yogurt and kefir will also not survive the freezing process. You can add herbs and spices if your dog likes them, but avoid onions, which can cause anemia in dogs. The small amounts in leftovers should not be a problem. One of the first questions that comes up when anyone wants to switch to a homemade diet is, how much should I feed? There are guidelines that can help you figure out a starting amount, but remember that each dog is an individual. The amount of food needed by each dog will vary considerably depending on activity level and metabolism, and such factors as the amount of fat in the diet. Keep a close eye on your dog’s weight whenever you switch diets and adjust the amounts you feed up or down as needed, increasing or decreasing no more than 10 percent at a time. It is healthier for dogs of all ages to be lean rather than plump. If you have a dog who is relatively inactive, or tends to gain weight easily, you can reduce the amount of fat in the diet by removing skin and visible fat from poultry, and by feeding leaner meats and low-fat dairy products. For dogs that need a very low-fat diet due to chronic pancreatitis or fat intolerance, boiling meat or rinsing after cooking will remove most of the fat. As a general rule, dogs will eat around 2 to 3 percent of their body weight in fresh food daily (use cooked weights for foods that are cooked). Large dogs will tend to eat a lower percentage, and small dogs a higher percentage of their body weights. Toy breeds may need as much as 4 to 5 percent of their body weight daily, while giant breeds might eat as little as 1½ percent, or even less. I might start with around 2 pounds of food a day for a 100-pound dog (2 percent of their body weight), 1 to 1½ pounds of food for a 50-pound dog (2 to 3 percent of body weight), ½ to ¾ of a pound (8 to 12 ounces) of food for a 25-pound dog (2 to 3 percent of body weight), and 5 to 6½ ounces of food for a 10 pound dog (3 to 4 percent of body weight). When making your calculations, remember that ounces are not the same as tenths – 1.5 pounds is not 21 ounces (1 pound 5 ounces), it is 24 ounces (1.5 * 16). If you feed two meals a day, divide the total amount in half for each meal. If you know your dog is very active, tends to be on the thin side, or eats more now than would be expected for his age and size, then start with higher amounts, and feed fattier foods. If you have a couch potato, or a dog who is overweight or gains weight easily, start with less, and feed lower-fat foods. Again, watch your dog’s weight closely, using a scale if possible, and adjust as needed. Note that leafy green veggies supply few calories, so don’t count them in when calculating the amount of food to feed, but add them on top of the rest of the diet. If you have a dog who is overweight and likes veggies, this is one way to increase the amount of food that she can have without causing weight gain. The fat content of the diet will affect the amount you feed. Most dogs should have a moderate amount of fat in their diet, which means limiting meats that are really high in fat, such as 75 percent lean ground beef and some ground lamb and pork products. When feeding poultry (e.g., chicken, turkey, duck), remove visible globs of fat, and maybe some of the skin as well, particularly if your dog isn’t very active. If you find you need to feed less than the amounts recommended above to keep your dog at a healthy weight, try reducing the amount of fat, so that he can have more food in order to get the nutrients that he needs (but don’t feed a really low-fat diet, as that will cause your dog to feel hungry all the time). On the other hand, if you find yourself having to feed more than would be expected for your dog’s size, you can increase the amount of fat. Working dogs and those who are very active and have trouble keeping weight on will benefit from a higher-fat diet. Keep in mind that dogs do not normally have problems with high cholesterol, so that is not a concern if you need to feed a high-fat diet. Grains and starchy carbs can also affect weight. Dogs who have trouble maintaining their weight on a normal amount of food may benefit from added carbohydrates, while reducing them can help those who need to lose weight. 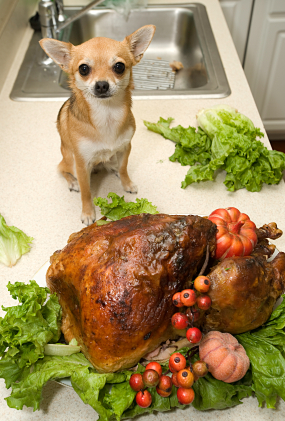 Most dogs have little problem switching to a home-cooked diet. If your dog is prone to digestive problems, then you may want to make the change gradually. Add just one new ingredient at a time and wait a few days to see how your dog does before adding something else new, gradually increasing the amount of new food and decreasing the amount of the old. If you add a lot of new ingredients at one time and your dog develops problems, it’s harder to tell what the cause might be. If your dog vomits or has diarrhea, return to his prior diet and make the change more carefully once his digestive system is back to normal. That may include feeding the new food separately from the old (at least a few hours in between meals), and feeding only one new food at a time, to see if your dog reacts to any of the new ingredients. The choice of whether or not to add supplements is an individual one. Healthy dogs fed a wide variety of fresh foods in appropriate proportions might have no need of supplements, though they may still benefit from them. The less variety you feed, the more necessary supplements become. Even diets that contains a wide variety of foods in appropriate proportions may be short on certain nutrients, most commonly vitamins D and E, and the minerals zinc, magnesium, potassium, selenium, and possibly iodine. Cooked diets are more likely to need supplements, since cooking destroys or reduces some nutrients. Dogs with health problems may also benefit from certain supplements regardless of their diet. The most important supplement is fish body oil (not cod liver oil), such as salmon oil or EPA oil. This supplies omega-3 fatty acids, which provide a variety of benefits and are hard to find in any diet, whether homemade or commercial. The recommended dosage for healthy dogs is around 1 gram (1,000 mg) of fish oil per 20 to 30 pounds of body weight (dogs with certain health problems may benefit from higher doses). You can also use sardines in place of fish oil. Two or three small sardines supply as much omega-3 fatty acids as one gram of fish oil. When fed in doses high enough to supply high amounts of EPA and DHA, some cod liver oil supplements would provide too much vitamins A and D. An appropriate daily amount of vitamin D would be 100 IUs for a small dog to 400 IUs for a large dog. Note that flaxseed oil and carmelina oil are not good choices to replace fish oil, as the form of omega-3 fatty acids found in plant oils (alpha linolenic acid, or ALA) must be converted in the body to the forms that dogs can utilize (EPA and DHA). At best, dogs probably convert 15 percent of ALA to EPA and DHA; at worst, none of it. Fish, grass-fed meats, and eggs are also good sources of omega-3 fatty acids. Whenever you add oils of any kind, you need to supplement with vitamin E, or the body will become depleted of this vitamin over time. See Vitamin E for how much to give. Because dogs can make their own vitamin C, this vitamin is not considered essential, but that ability may be reduced during times of stress or illness, and additional vitamin C may provide benefits even to healthy dogs. Similarly, dogs may be able to get vitamin D from sunlight as people do, but during winter months, this may not be enough. Dogs that are kept primarily indoors or that have heavy coats may also get limited vitamin D from sunlight. Minerals are tricky to supplement, as they can be dangerous at excessive levels, or if they are not balanced properly with other minerals. For example, zinc binds with copper, so if you give a supplement long term that includes zinc but not copper in proper proportions (10:1), eventually this can lead to a copper deficiency. Minerals are most safely supplemented in whole food form. Green blends that contain foods such as kelp, spirulina, Irish moss, fenugreek seed, and alfalfa are an excellent source of trace minerals. (Note that it is important not to give too much kelp, as it is high in iodine and too much can suppress the thyroid.) It’s best to give kelp in very small amounts -- ¼ teaspoon or less for a large dog. Another option is to give a complete multi-vitamin and mineral supplement made for either humans or dogs. If using one-a-day products made to meet minimum daily requirements for people, such as Centrum for Adults Under 50, you can give the full adult human dose to dogs weighing 50 pounds or more, half the human dose for dogs weighing 25 pounds, and one-quarter the human dose to dogs weighing 10 pounds. Larger dogs would get proportionately higher doses. If the human product you are using is designed to be high in vitamins and minerals, then base the dosage on the size of your dog compared to a person, where a dog weighing 60 pounds, for example, would get half the human dose. Very small dogs require products made for dogs in order to get the dosage right. Reduce the amount of added calcium if the amount in the supplement is significant. Don't use children's products that contain xylitol, which is toxic to dogs! Organic apple cider vinegar, nutritional or brewer’s yeast, and dark molasses also supply trace minerals. Other fresh food supplements that may provide benefits include raw honey, ginger (especially good for digestion), and fresh crushed garlic (no more than one-half of a small clove per 20 pounds of body weight daily, as more can cause anemia; see Garlic for Dogs - How Much and How Often? for more details). You may want to add probiotics, especially if your dog is stressed or ill, has been treated with antibiotics, or has had diarrhea. Supplements with multiple strains of beneficial bacteria are preferable to plain acidophilus; Bacillus coagulans (formerly called Lactobacillus sporogenes; available at Amazon) and Enterococcus faecium are two that may be especially good for dogs. Bifidobacterium animalis (found in Probiotic Miracle from Nusentia, available at Amazon) has also been shown to reduce the time for acute diarrhea to resolve. Several canine probiotic supplements, such as Jarrow Formula's Pet Dophilus Powder and Fortiflora from Purina (best price at EntirelyPets), contain Enterococcus faecium. (Note that despite its proven beneficial effects, E. faecium may be best used short-term due to possible issues with antibiotic resistance, opportunistic infections such as UTIs, and effects if transmitted to humans. Strain SF68 appears to be safer than other E. faecium strains.) Digestive enzymes are also helpful for some dogs with gastrointestinal problems. See Supplements for more information. The nutritional requirements of puppies vary from those of adults, and deficiencies (or excesses) are more likely to cause harm. Puppies need more protein, fat, calcium, and phosphorus than adult dogs do, but too much calcium can lead to serious orthopedic problems. This is especially true for young (prior to puberty), large-breed puppies. These increased needs continue as long as your puppy is growing, and are highest during periods of peak growth. The exact amount of calcium that puppies require is a matter of endless debate among nutritionists. I’ll outline the most prominent recommendations, and suggest an approach that should result in your home-prepared diet falling into the middle of these ranges. The 2006 National Research Council (NRC) guidelines recommend that puppies receive 3 grams (3,000 mg) of calcium per 1,000 kcals, which is three times its recommended amount for adult dogs. The minimum requirement is 2,000 mg/1,000 kcals, but they also say that large-breed puppies (anticipated adult weight greater than 55 lbs) should get at least 250 mg calcium per pound of body weight up to the age of 14 weeks. The nutrient guidelines published by the Association of American Feed Control Officials (AAFCO) express the recommended amount in a different way, suggesting that puppy diets include between 1.0 and 2.5 percent calcium on a dry matter (DM) basis. In comparison, the 2006 NRC recommendations are 0.8 to 1.7 percent for smaller breed puppies (adult body weight under 55 lbs) and 0.8 to 1.2 percent for larger breed puppies (based on a diet that contains 400 kcals per 100 grams of food). Some nutritional research suggests that large-breed puppies have optimal skeletal development and mineralization when fed a diet that contains between 0.8 and 1.0 percent calcium (DM), as long as the diet uses high biological value protein (from animal products) that provides 420 kcals per 100 grams of food. The percentage of calcium needed increases when caloric density is increased (higher-fat diets), so that the total amount of calcium per calorie remains the same. The percentage of calcium needed also increases when more grains are fed, since the phytates in grains bind calcium. Studies have shown that skeletal abnormalities and lameness can result in large-breed puppies fed more than 2.6 percent calcium (DM), or more than 6,500 mg calcium per 1,000 kcals (one study found significant bone abnormalities in growing dogs feed 4,900 mg calcium per 1,000 kcals). The 2006 NRC recommends a safe upper limit of 4,500 mg calcium per 1,000 kcals for giant-breed dogs (the limit is likely higher with smaller breeds). Minimum amounts are less well defined, but problems may occur when diets contain less than 0.6 percent calcium (DM). The amount of vitamin D in the diet will also have an effect, since it increases the absorption of calcium. Small-breed puppies can tolerate a much wider range of calcium than large-breed puppies without developing problems. Here's my suggestion: If you add an amount of bone meal that provides between 1,000 and 2,000 mg of calcium per pound of food fed (not counting any low-calorie veggies), this should provide adequate but not excessive calcium. If you cook the meat, use the cooked weight to determine how much calcium to add. The higher amount in that range (2,000 mg per pound of food) will meet both NRC and AAFCO guidelines, providing between 2,000 and 4,000 mg of calcium/1,000 kcals and 1.6 to 2.0 percent calcium (DM) based on the diet recommendations I've given. The lower amount (1,000 mg per pound of food) will provide between 0.8 and 1.0 percent calcium, which some feel is most appropriate for large breed puppies. This is lower than NRC and AAFCO minimums, but not low enough to cause deficiencies. Remember, you need to add more calcium per pound of food fed if you use a high-fat or high-grain diet. If your dog's diet provides calcium in amounts that fall at the low end of the ranges suggested by experts, its advisable to supplement the diet with vitamin D, which enhances calcium uptake. (Don’t use calcium supplements that contain vitamin D, though, as the amounts will be too high). If you want to do your own calculations, you can analyze the diet you’re feeding using a nutrition analyzer (see Resources below). Puppies also require more protein than adult dogs. Remember that there is no danger in feeding high-protein diets to puppies. The best thing you can do for large- and giant-breed puppies is to keep them lean and slow-growing by limiting the total amount fed, not by limiting the percentage of protein in the diet. Most puppies will do well with a diet that has a moderately high amount of fat. Puppies need more fat than adult dogs, but too much can lead to rapid growth (if they get too many calories), or limit nutrition (if you have to feed less than the normal amount to control growth). If you have a very active puppy who eats more than would be expected for his age and size, then you can increase the amount of fat in his diet. Don’t feed a low-fat diet to a puppy. Figuring out how much to feed a puppy will depend on the pup’s age as well as current weight and anticipated adult weight. Puppies eat much more for their weight than adult dogs do, and young puppies eat more for their weight than older puppies do. That’s one of the reasons why it’s important to feed younger puppies three to four meals a day. Small-breed puppies reach their adult weights more quickly than large breeds do. A small-breed puppy will eat as much as an adult by the time she’s around three months old. A large-breed puppy will eat as much as an adult by the time she’s around 5 months old. In both cases, they’ll eat a little over half that amount at 8 weeks of age. Small breeds will eat a higher percentage of their body weight daily than will larger breeds. Keep in mind that the appetite of puppies is notoriously varied -- they eat more when they're in a growth spurt and less when they're dealing with hormones and teething -- so it's important to pay attention to the individual dog and adjust as needed. It's best for puppies to be lean, not chubby, especially the large breeds; keeping them lean will decrease the likelihood of hip dysplasia and other orthopedic problems developing. Adjust the amount of food as needed to keep your puppy at the proper weight, with ribs easily felt and not covered in fat. Feeding a cooked diet takes time and may cost more than feeding packaged foods (though it’s possible to keep costs down by shopping sales and ethnic markets, and buying food in bulk), but the rewards are many. Dogs fed properly prepared homemade meals are usually healthier than dogs on commercial kibbled or canned diets, and you may find your vet bills are reduced. There is much joy in watching our dogs eat fresh, healthy meals we have prepared ourselves, knowing the quality of the ingredients and the value they provide, as well as the obvious enjoyment our dogs get from their food. Remember that it’s not necessary to feed a balanced diet every day, as long as the diet is balanced over time. For example, it would be fine to feed eggs one day alternating with organ meat the next, rather than feeding both foods every day. Or you might feed just muscle meat one day, with a mix of organ meat, eggs, and dairy the next. Following are suggested amounts for a 40 pound (18 kg) dog. Adjust as needed for your individual dog, keeping in mind that, on average, larger dogs will eat less for their weight, and smaller dogs more. 1,000 mg calcium (for example, ½ tsp ground eggshell, or 1 tsp Animal Essentials Natural Calcium, or 1 tsp NOW bone meal, which has 1,000 mg calcium per rounded teaspoon). Christie Keith of San Francisco, California, has raised Scottish Deerhound puppies using Dr. Pitcairn's Growth Diet C (see Resources below), with certain modifications. Keith had one dog with severe grain allergies. She consulted with Dr. Pitcairn about the advisability of modifying his diet plan so she could use vegetables in place of the grains in the recipes, and he agreed that this was fine. Keith later substantially reduced the volume of carbohydrates as well, using 1 cup of sweet potatoes, for example, instead of 3 cups of grains, but continued to add the same amount of supplements specified in the recipe. "I replaced the grains with a lesser volume of a combination of cooked and raw veggies, especially sweet potatoes," says Keith. "I think it is better that way. I have raised three litters on this substituted recipe with no problems." Keith follows Pitcairn's supplement suggestions, giving bone meal, nutritional yeast, cod liver oil, vitamin E, iron, and Healthy Powder according to the guidelines given, but says, "I leave the C out of the Healthy Powder and supplement directly with Ester-C or sodium ascorbate powder.” She also substitutes fish body oil for the vegetable oils in the recipe. Garlic: beneficial in doses up to 1 small clove per 20 pounds of body weight, but can cause anemia if given in larger quantities. Potatoes (the regular kind, not sweet potatoes), tomatoes, peppers (all kinds) and eggplant may aggravate arthritis pain, but are otherwise fine to feed. Grains and starchy veggies may also aggravate arthritis and other forms of inflammation. Onions: can cause a form of anemia. Reaction is dose-dependent and can build up over time. Small amounts are not harmful, but there’s no reason to feed them. Macadamia nuts: toxic to dogs, even in very small amounts. Chocolate and caffeine: toxic to dogs. Xylitol, a natural sweetener, is toxic to dogs. It is found in some water additives, such as C.E.T. AquaDent and Petrodex Breath Spray For Pets, made by Virbac Animal Health, BreathaLyser Plus and AQuala, made by imRex, Inc.. It is also found in many human products, including sugar-free gum, mints and children's vitamins. See Xylitol - The Sugar-Free Sweetener That's Toxic To Your Dog for more information. Grapes and raisins: can cause kidney failure in a few dogs for unknown reasons if fed in large amounts; 3 to 6 ounces per 20 lbs of body weight is the lowest amount known to have caused toxicity. Many dog owners use grapes and raisins – in small amounts – as a training treat or snack and have seen no ill effects; others feel the potential for danger exceeds the value of feeding grapes or raisins. Most important: Do not leave bunches or grapes or boxes of raisins anywhere your dog might be able to get them. Most cases of grape toxicity occurred when a dog “stole” a large ration. Create an account to analyze foods and recipes to determine calories and calcium amounts. Select NATS ver 2.0 and enter the foods you’re using in the diet to determine the number of calories you’re feeding. The 1995 edition contains his Growth Diet C for puppies; the newer 2005 edition does not. (Dr. Pitcairn comments: “In the prior editions we had two classes of recipes, (one) for growing animals and (one) for adults. It became easier to just up the protein levels of the adult recipes and to make the recipes suitable for both groups.”) Check your library or half.com to find the older edition. Made and sold by Animal Essentials, (888) 463-7748. See Spot Live Longer, (541) 685-0538. This supplement is meant to balance a limited homemade diet that is high in meat and animal products. Made and sold by Wysong; also available at many pet supply stores. This supplement is meant to balance an all-meat diet. (800) 748-0188. Made by Furoshnikov's Formulas, 612-388-2315. This supplement is meant to balance a limited, incomplete diet that is high in carbohydrates. Made and sold by DVM Consulting. This supplement is meant to balance a limited, incomplete diet that is high in carbohydrates. Carnivore Blend now available for high-meat, no-carb diets. (888) 346.6362 or (530) 756.3862 outside the U.S.
Made and sold by Aunt Jeni, (301) 702-0123. Made by The Honest Kitchen, 866 4379 RAW. This is not a supplement but a dog food mix designed to be combined with fresh foods. It contains alfalfa [since replaced by peas], sweet potatoes, cabbage, celery, apples, spinach, organic kelp, coconut, bananas, zucchini, and honey.